For the latest edition of the Top 5 Movie Guide, we decided to compose our lists around some of the most memorable Movie Moms! You might be saying to yourself, Gee, this sure would have been a great category to do last week, when we were all celebrating Mother's Day.. Well, you're absolutely right, you just forgot one thing - we're Slackers by name, so while we do usually get to anything applicable to the time, don't be surprised if we're a week or two late in doing so. We have a reputation to uphold, mind you. These things will happen from time to time. Anyway, there's no film coming out this week that we centered this category around - though, surely there's a mother of some sort present in "Star Trek Into Darkness" (unfortunately most of them died in the first installment...). This is simply our late Mother's Day gift to all of you readers out there just dying for a more comprehensive list compiling some of the most notable moms in movie history. Hit the jump to see which characters and films we each came up with! I wanted so badly to include "Mr. Mom" on this list, because 80's Michael Keaton is always good. Unfortunately, there were a few other moms/films that I needed to showcase instead. Pretty easy #1 selection for me here. It helps that she's one of the more present moms in her respective film, but what really puts her over the top is her ability to be caring towards her son while still being great with a gun. Pretty rockin' combo. This one is nice because you get two for the price of one. And I love the back and forth dynamics present in this movie. Between both moms (Julianne Moore and Annette Bening) and Mark Ruffalo's character, there are multiple times where you're despising each of them and also when you're rooting for each of them. Overall, great chemistry between all involved, and the tone and style are perfect for my movie tastes. Is she the scariest mom ever? Possibly. I'm not sure I'd make it out alive if I grew up in a house with her. Moms who get this twisted with their religious beliefs are the worst kinds of moms. It's rare that you want to root for a girl terrorizing and murdering everyone in her town - this upbringing allows us to do so. This mom is close to being just as creepy. She probably is better with the subtle mental abuse that she inflicts on her daughter, and the obsessed former dancer who never made it and is now trying to live out her dreams through her daughter storyline is pretty messed up. Encouragement and support is nice, but obsession to this level is scary. She kind of takes it to the ultimate level in terms of sticking up for her son. You can't really do anything more than this. If she was more present in the film this would probably be a bit higher; it's still good enough to make the cut here though. Even in a robot apocalypse she can offer guidance and support. Homemaker, psychopath, and a brilliant manipulator of the courtroom - she's a complicated lady. As a mother and a human being, she is absolutely terrifying. She's a badass like Sarah Conner, but has her beat in vegetable chopping techniques. Hell hath no fury like a mother avenging the death of her child. She raised the leader of The Resistance against Skynet. What more do you need? Do NOT get between this lioness and her cub. The black & white Betty Parker gets my vote, as she makes one of the most delicious looking meals I've ever wanted to devour. I love the sound of her drenching the pancakes in maple syrup. Heck, even her marshmallow rice squares look absolutely scrumptious. The amount she loves her son melts my heart to the point that this movie is difficult to watch. For this list I decided to go with moms who were good. Basically that happened because when I was doing research for this list, I happened to be eating and came across a picture of the mom from "The Brood" and it made me lose my appetite. So I wanted to avoid coming across any pictures that might be similar to that. I'm still happy with how my list turned out. I can go on all day about how John Connor hasn't really done anything to deserve the sacrifices so many people have made for him, but for me, Linda Hamilton plays the ultimate movie mom. This is one of the two most iconic female action roles of all time, and an easy #1 choice. Molly Weasley (played by Julie Walters) is sort of the mother Harry never had in this series. She treats him just like she would any of her other kids. I went with the last film because you finally get to see how far she will go to protect her children when she steps up and takes on my favorite villain from the entire series, Bellatrix Lestrange. If it weren't for the compassion and acceptance of Diane Wiest's character in this film, Edward would've been stuck up in that house for the rest of his life. She was willing to look past the fact that Edward was different and realize that everyone needs someone to care about them. Granted, I'm not sure why she ever thought putting him on a waterbed was a good idea. This is another example of a mother loving her son unconditionally no matter how different he may be. Throughout Forrest's life, she is the one person he can always turn to for love and encouragement. Bet you weren't expecting someone to work Arnold onto this list, were you? I'll be honest, it's been so long since I've seen this movie that I don't remember a whole lot about it. I just wanted to highlight this film for any younger audience member reading this who may not realize that at one point, action icon Arnold Schwarzenegger played a pregnant man. 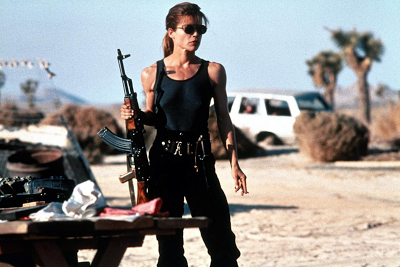 Sarah Connor is my all-time favorite movie mom. She’s just a carefree college student in the 1980s until her life is changed forever. A cybernetic organism is sent back in time specifically to kill her so that she never is able to conceive her son, John Connor, future leader of the resistance. This is a standard young woman until faced with a seemingly insurmountable task. She works to save herself, and her future child. Later, she is faced with protecting him again from a newer, even more dangerous threat. I think I want to be Sarah Connor for a million reasons, and Kyle Reese is certainly one of them. She’s totally badass. Mrs. Bates has got to be one of the creepiest movie moms ever. She really did a number on her son. An overbearing and emotionally abusive mother from the mind of Alfred Hitchcock still has gravity over fifty years later. Luckily, I was able to watch this movie for the first time ever in the theater without knowing any plot twists, exactly the way Hitchcock wanted it. Mrs. Robinson is perhaps one of the most famous movie mothers of all time. She’s calculating and odd and beautiful and unhappy. She uses the Dustin Hoffman character as her plaything, and threatens him when he has a chance to find happiness with her daughter. The well-to-do parents in this movie forsake happiness for image and convention with no care to how it affects their children. This suffocating upbringing, along with inappropriate relations lead the children to make strange decisions indeed. Although Frances McDormand doesn't have a huge role in this movie, she still is an interesting mother figure. She hides her son’s true age from him and attempts to shelter her children from a changing world. She’s a straight laced woman, but the viewer knows that she cares for her children deeply. When they need to go, she lets them. Even though her son is young, she allows him to travel around the country with a rock ‘n roll band, where he learns a lot about the world from his own bizarre microcosm. In a neighborhood full of odd women, Edward was adopted by one with a very kind heart. I love how she takes him in and the awkward way in which she learns to care for him. She sees immediately that he is not a monster, and when everyone turns on him. She and her family are the only ones that don’t. She supports him in all of his endeavors. Really, she’s just a standard great mom, and her adopted child just happens to be a humanoid with weapon hands. Who would have guessed - with as rare as it is to enshrine a film on this site, that's now two weeks in a row in which a film has managed to accomplish such a feat! This time, it was "Terminator 2: Judgment Day", James Cameron's 1991 hit, that hit in the top spot on all five lists. It appears as if most of the writers above had a pretty easy choice in putting this character and film in the #1 spot. Outside of motherly characters, when discussing some of the best female characters of all time - period - you have to put Sarah Connor in that discussion. So another welcomed film enters the vaults here at the Slackers Selection Movie Blog. While it won't be available for future lists, you can always check it out (and its few brethren) in the Slackers Shrine. Otherwise, four other films appeared in multiple variety (for the record, there were a total of 17 different films listed above). But outside of T2, which appeared on all five lists, nothing hit on more than two. The four films to do so were "Carrie", "Friday the 13th", "Psycho", and "Edward Scissorhands". Looks like we have a good mix of evil and crazy holding down those first three slots, with some kindness (yet in a crazy and creepy world) occupying the last. Overall I would say if you're looking for some of the more intense movie moms, these are some great places to start, but there is a wide variety of motherly figures displayed above that cover just about every genre. With as much variation as there was this week, everyone should be able to find something worth their while. As always, we hope that each of the selections above helps to expand your knowledge and appreciation of some of the best films that this category has to offer, and guides you to better and more enjoyable all-around viewing experiences.